The mainstream news sources seem determined to ignore the extent of the global slowdown in trade. 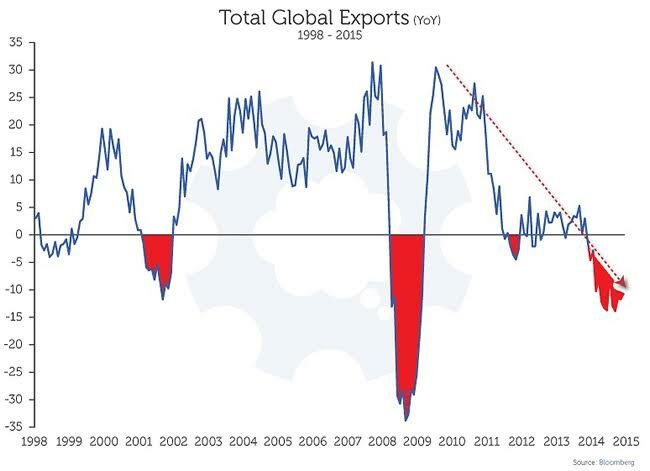 Whether exports, imports, industrial production or whatever your preferrred metric, the facts are undeniable. Nevertheless, the mainstream media chooses to refuse to cover it. It begs an obvious question of - why? What needs to be understood about the global economic slowdown is that it stems from economic activity in the two engines of world activity which are now stalled. 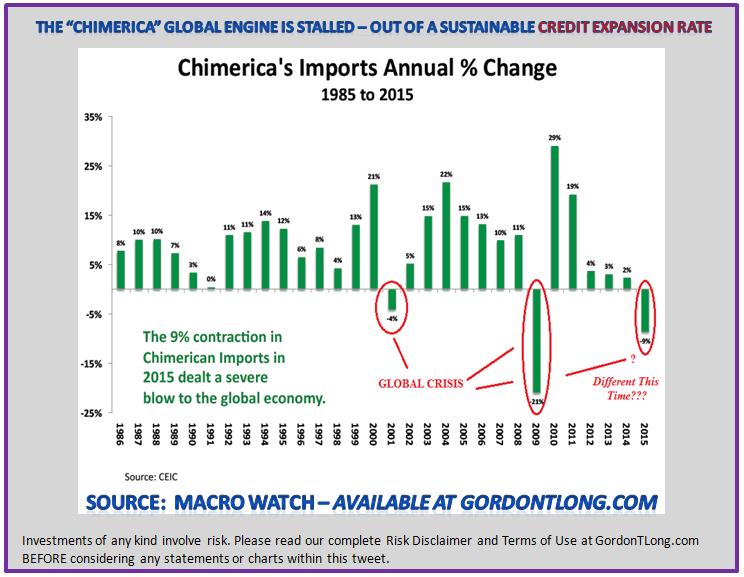 China and America ("Chimerica") are slowing rapidly as a result of an inability to fundamentally sustain their current credit expansion rates. Desperate attempts by both countries have been unsuccessful in altering the downward trajectory which is steadily gaining momentum. The Central Bankers of the world are acutely aware of this fact and know how devastating a global recession would be in the current highly indebted and over leveraged financial environment. 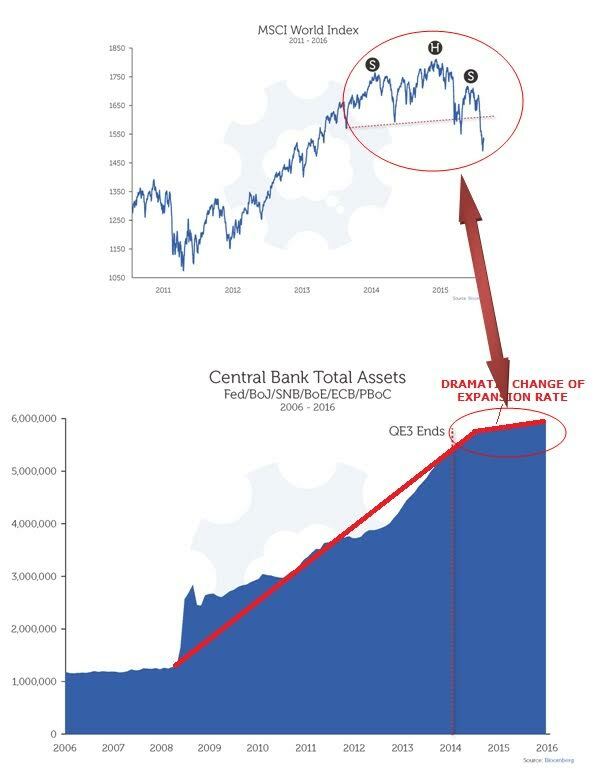 Though Central Bankers programs have been unsuccessful they have fully understood since the year beginning market drawdown that they must act - and fast! 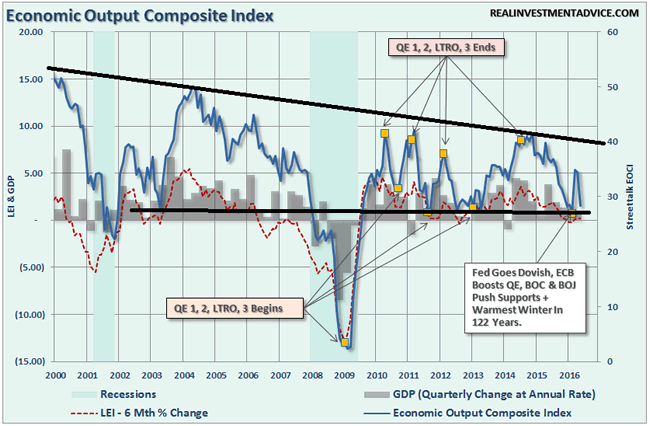 The US Economic Output Composite Index illustrates how the time had come in Q1 2016 relative to previous intervention programs. CALL TO ACTION - Failed Central Bank Policy Dictated "More of the Same!" The Central Bankers reacted and reacted forcefully beginning in Q1. 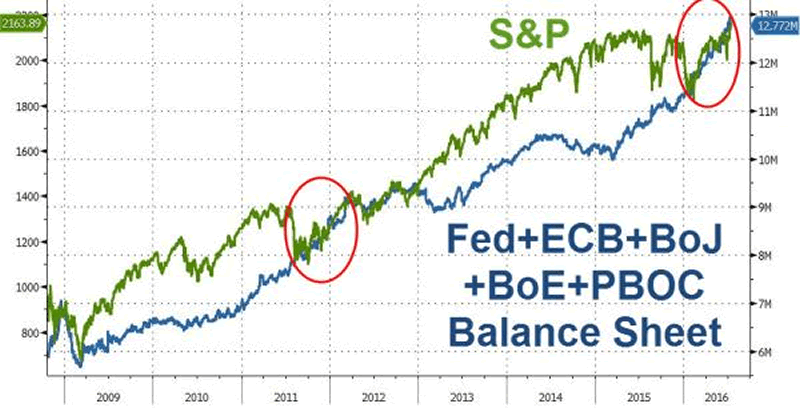 They have taken "liquidity pumping" at $180B / month to levels more than double those during QE3 with more promised to soon come from the BOE, ECB and BOJ. 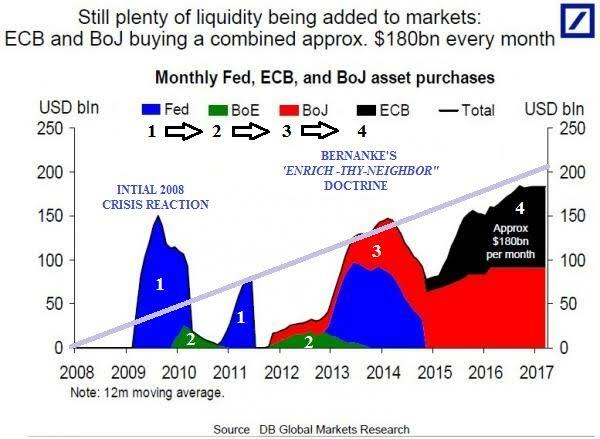 The Bernanke "Enrich-thy-Neighbor" Doctrine is now in full bloom as the central banks in a coordinated sequential manner are implementing further policies to dramatically increase global liquidity. ILLUSTRATION: BERNANKE'S " ENRICH-THY-NEIGHBOR" DOCTRINE IN "FULL BLOOM"
As former Federal Reserve Governor Kevin Warsh said on CNBC, the Fed is not "Data Dependedent" but rather "Market Dependent"! Central Bankers are reacting to the market for fear of an errosion in collateral values underpinning massive excess financial leverage. They had to act or crumbling collateral values associated with a "Rehypothecation" implosion would quickly engulf the markets.The markets have been signalling major technical reversals are ahead since early 2016. The Central Bankers had little choice in their mind but to undertake the programs they did. We have laid out our expectations of an "M" top since near the market bottom in early 2009. As shown below we have completed our "M" top and one of two courses will now be followed. The market will begin a protracted secular Bear Market OR the Central Banks will flood the world with liquidity thereby artificially lifting the markets. 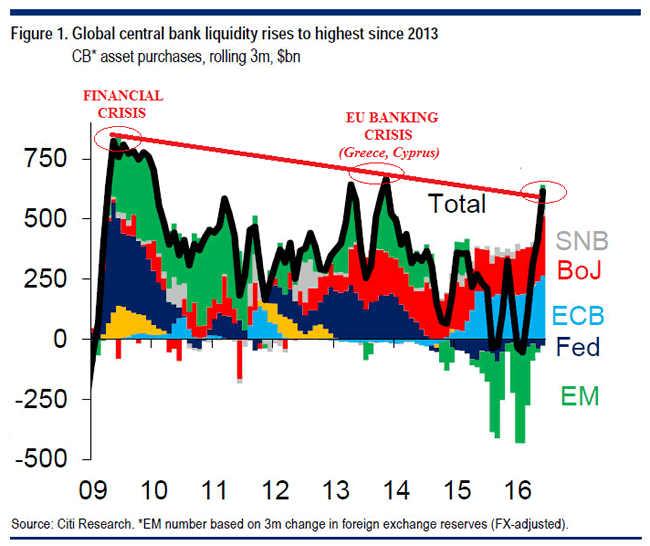 The following chart illustrates that the Central Banks' globally coordinated liquidity pumping policy to stop the markets from following is presently working. 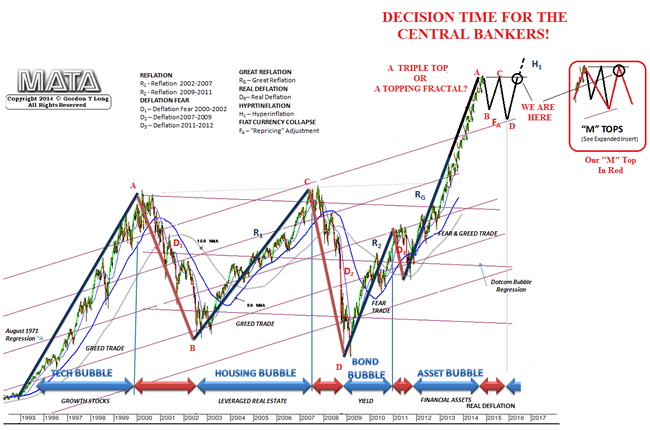 This would suggest that our "M" top will now "morph into a 'fractal'" of the Megaphone pattern we have seen since the Dotcom Bubble burst in 2000. 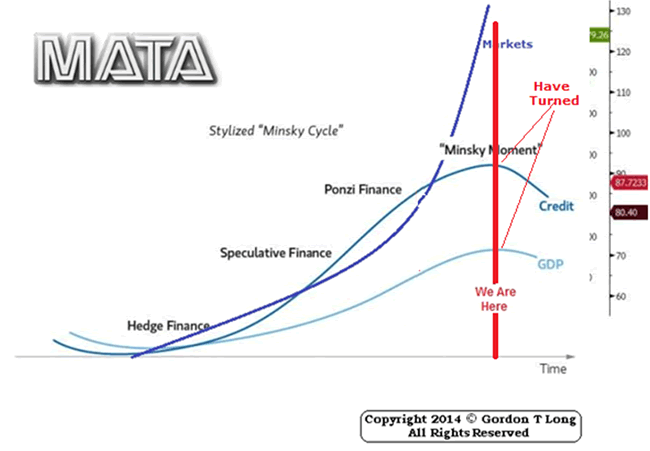 This will final leg will be the Minsky Melt-up we have also suspected still lies ahead. IT WON'T WORK - 7 Years of Unintended Consequences are Coming Home to "Roost"! The Central Banker actions will temporarily work but the Credit Cycle has turned which will quickly make their efforts futile. Expect a resulting Currency Crisis to dominate the financial markets in 2017.